Chances are you know someone in Digital Marketing, Brighton & Hove is literally full of them ranging from huge agencies (with equally massive prices) to smaller boutique agencies and one-man bands. So chances are if you have found this page it is via word of mouth rather than Google Position. And that’s a good thing, because we strive to do an amazing job for our clients rather than invest heavily in attracting new ones. Our belief is that good service, honesty and transparency, over-exceeding and delivering results is what matters. We specialise in e-Commerce as Return on Investment is so evident, and our worth and value proved. The Digital Marketers; all for one, and one for all. Without clients we don’t have a business, so we make an effort to understand yours. This is the most vital route to success, as our experience means we can give the best advice and direction on where to spend your advertising budget. It is all about your customer demographic. Digital Marketing covers such a wide spectrum as it is rare to be experts in all fields at our size agency. We succeed in this as we have put the time in on these channels, and maintain links with partner specialist agencies to keep up to date on the latest techniques. We work by a methodical data-driven digital marketing method, studying data to prove the answers. So lets start with a basic explanation of channels and the most suitable target demographics, and common terminology to provide some clarity. Digital marketing is a broad term that covers search engine optimisation (SEO), paid advertising, search engine marketing (SEM), content marketing, influencer marketing, content provision, e-commerce marketing, social media marketing, social media optimisation, e-mail marketing, search and display advertising. Available as ad-hoc tasks, monthly services or training sessions for any skill level. Most people know Google Pay Per Click Advertising as the sponsored Ads on the top of Google. But Google Ads are actually split into search, display and shopping which I will break down in more detail. A lot of small businesses have tried Google Ads at some point., likely even having assistance from a Google Accounts Manager. in 99% of cases they would have given up for poor results, continue to overspend, or tried an agency. The reason for this is simple; Google’s business aim is to make money like of all us. And the most effective way to do this is to create bidding wars, or take away your control (Adwords Express!). Easiest way to prove this is simple; if your ad is clicked on and no-one else bids, should be 1p right? Ask your Google Ads Manager why you don’t get charged that and see what answer they give. If that doesn’t prove my point, then consider “low search volume”. If a search term is too long tail or rarely searched, your ads won’t show. Still not convinced? Then ask Google about what “On the first page of search results” means and why setting a low CPC means won’t appear on top even if no-one else is bidding. Cost Per Click has gone up from mere pennies to being £15-20 per click in some sectors. Not helped by Lead Generation networks and nationals selling leads locally. There is also the real possibility that they target sectors at the same time as part of their strategy, where their standard advice is always to increase Max CPC. Rather than going further into Dynamic Search Campaigns and Enhanced Bidding, let’s move on with how Google looks when you search. 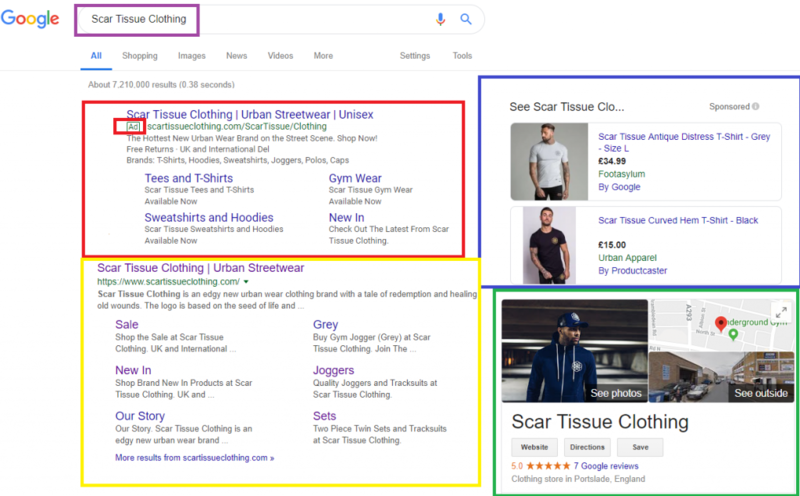 Yellow – Organic Listing, could be below four google ads on desktop, plus images or map. This is your google search sponsored ads and your reactive marketing to pick up people searching & looking for services/products. Watch-outs -Broad key terms can pick up a lot of unwanted search terms. Consider use of exact match, broad match modified or phrase match. This is thing most people find confusing but is the most vital to comprehend. So lets says our two keywords are Black Cap. Exact Match – Shows ads on exactly the keyword with slight spelling variants, so Black Caps, etc. Phrase Match – Picks up use of the keywords in a sentence, when used the same order as the keywords. So would work for buy black cap, but not black trucker cap. Product based adverts that appear on the top bar or on the shopping had. These are great for selling goods as they instantly show price, size and the image. Proven to improve your click through rate (CTR), the inventory is not limited to eCommerce. Watch-Outs – Advertising out of stock products. Direct feeds from your website are best practise. These are image ads on the display network, either reaching new customers or remarketing to site visitors. A handy reminder to a consumer that they were on your site and can be used to dynamically remarket a product. While website visitors have grown used to display ads and skip them so clicks are down, they are best used for subconscious free advertising. Example below. Watch outs – mobile apps and other sites designed to make money by people clicking on ads unintentionally. To some, Facebook advertising is boosting posts. It is so much more than that. Facebook is far more intrusive than Google, with users interaction and shared information available to tailor advertising to them. This makes it a incredibly powerful marketing tool with very detailed targeting with age, profession, employer, interests, etc. While technically you can do some of this with Google, you have to ask yourself where they get this data which is gmail related so nowhere near as accurate or as big a database. Watch-outs – Campaign types are crucial here, as it’s mostly not Pay per Click but by impression. Since Facebook 2012 takeover of Instagram, advertising has been possible via the Facebook advertising tool. This is to a younger demographic, requiring good photography and editing to catch the eye. It was created for an Instagrammer to post pictures to a feed, indeed the original name was Instant Gram, amalgamating instant camera with telegram. The social networking service shares all customer data with Facebook so is equally powerful. Watch-outs – Ads need to be of a high quality here. You can advertise on Youtube and boost your videos via Google Ads. Twitter and Linked In also have advertising. The latter is good for professional targeting. Available as monthly services or training sessions for any skill level. For the record “free” still means loads of work. Good for the time-rich but cash-poor. Content creation is the biggest required here. Businesses need Social Media as that is the way the world is turning. They give validity and authority to the brand, and give a platform to showcase products. It’s also fast becoming the go-to customer service platform, but more importantly the “public shaming” is growing so Social Media Management is fast becoming a full time job. Watch-outs – There are many bots and programs to give an inflated number of followers and interaction. Some fake which are worthless and some real. Type in any word into Google, Bing or Yahoo and each search engine will show you the top 100 searches that it thinks are the best using their secret sauce algorithm. There are many white hat or black hat techniques for doing this, but the evergreen method is clearly identifying to the search engines what your content is about. Watchouts – Match and exceed means you can’t do some work then leave it for years. Regular checks and additional work is needed. Customer reviews on social media, review sites or google are very important to validating your business. Bad reviews plant seeds of doubt. A must for local businesses, and any business really. You can show for searches other than your brand name. This free service is vastly under-rated and under used. Affiliate marketing is when external companeies bring you customers in exchange for payent, usually as a percentage of sale. Watchouts – Voucher sites offering your discount codes so you pay them commission on orders where customers have looked for active discount codes. So you could lose 50% of the sale without realising it. Pintrest, tumblr, youtube are just some examples of how you can attract a new audience.